Remember the Keyport? Well the kit for the limited edition just showed up today - basically make copies of keys you want in the device, put them on the ring, stick the stickers on then, give a description, pop them back in the padded envelope, and fedex it away! The “I use this key for” section makes me pretty nervous (as if sending keys doesn’t already - even valet parking makes me nervous… we all watch our share of spy/con flicks, it’s so easy to get in where you want to… between lock picks and social hacking… especially if people will send you the keys AND a description of which are for what? )… i wonder if all they are really asking is what type of car if its a car key… the rest should be self explanatory to a locksmith right? But i am super curious about what the final product will look like… Well, at least they aren’t asking for pictures of the corresponding locks and lock locations with video proving the keys work… Anyhow, thought you’d be interested to see the next step of the Keyport, Happy almost turkey day. Click the pics to find out more! 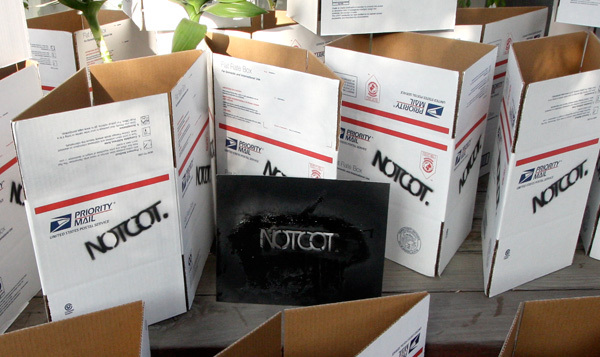 In addition to weeks of Gift Guiding to come, here is a roundup of giftable goodies from NOTCOT.org recently! * Joy To The World at a bar mitzvah?! 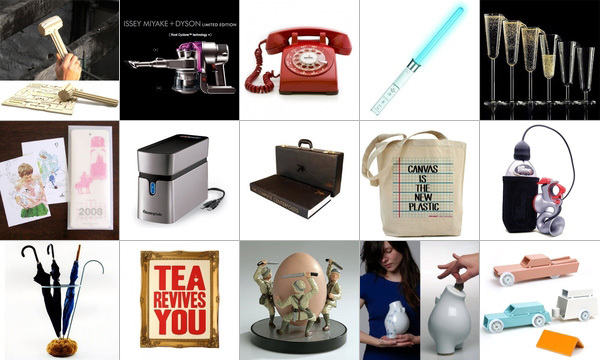 Everyone’s doing it ~ so here’s our gift guide too. Since i’ve never tried doing this before ~ and apparently i got a bit ambitious in my initial mockup… ours are a bunch of collages, with hand written notes, an exclusive playlist from Burst Labs’ “Naughty or Nice”, and you can click on any image to go read more… oh, and did i mention i’m apparently going to try to do one of these every day for 31 one days? Weekends too! It’s 5am, and i think i just got it all set up… so here we go with day 31 in the countdown (which means we will be ending Dec 21)… so take a peek at our first sponsor Charles & Marie… we have a line up of great sponsors (all friends of NOTCOT with products we love)… and mixed in between will be just some random themes of products we think would make fun gifts (or things we want). On unexpected things ~ i’ve been having a lot of conversations with mid-20 something guys about high priced watches, particularly those who didn’t grow up with them, and the desperate coveting of high end watches as status symbols, followed by the implication that that watch would get them some. And i’ve been mocking them all, but after this weekend - OK, i take it back, maybe the watch thing *can* work. 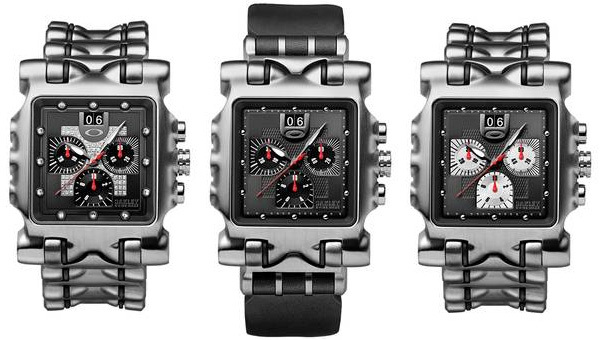 The unexpected stand out from this Oakley weekend is definitely the Oakley Minute Machine. It caused some amusing drama at the after party, and perhaps that IS the best marketing strategy, after all that now even i find myself curious about it… well the Oakley Minute Machine Diamond Dial Edition ($3,500) anyhow (left watch)… although the Black face Titanium Edition ($1,195) is tempting too (right watch)… then there is the Unobtanium Edition($995). Freshly back in LA, and slightly scared to wear my Tom Fords… as i told you earlier, i just spent two nights up in Half Moon Bay with the Oakley crew at their golf tournament, where i got to check out the Rolling O Lab. 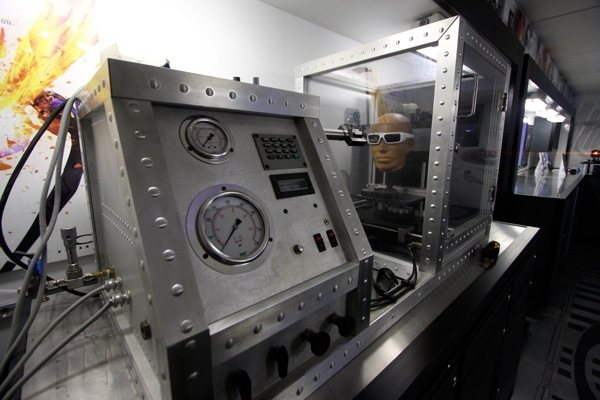 Now, i already showed you the *fun* side of the O Lab, here’s the fascinating rolling research lab in a trailer… it will really bring out the hands on science geek in anyone. I tried to get pics of all the fun bits to share with you… but here’s the cliff notes version before we get into the show and tell: if something blasts you in the face, most glasses will stab you in the eye - Oakley lenses just scratch slightly… if you lay down and drop a nearly 2 pound pointed weight on your glasses, you will have something sharp sticking out of your eye - Oakley lenses just get a dent… if you point lasers through the lenses to emulate your vision, the Oakleys actually meet at a point as they should - the others (and we put our random glasses on) were all over the place meaning your eyes are overcompensating (so THAT’s why some glasses give you headaches quickly)… ok ok there’s more, and it was all rather fascinating to me, so please don’t mind the ranting… see pics below - of inside the lab, and also the GIANT corona bottle that was at the first hole. 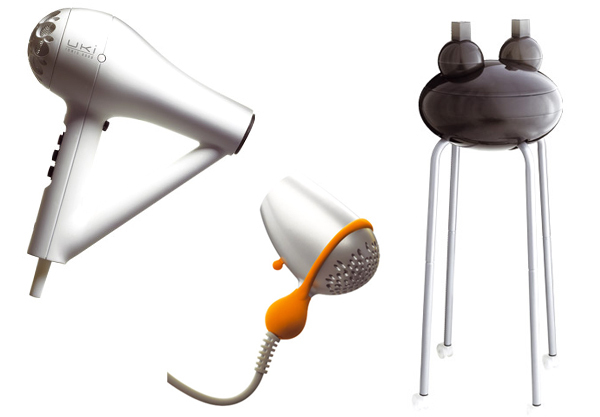 Uki International has some playfully modern hair styling tools ~ most noteworthy is this tiny “go on” 500 watt hair dryer that is a mere 9cm in length! and weighs in at only 110 grams. (see different angles of how adorable it is below) Also interesting is their Ionic 6000 that has apparently the “max ergonomics, allowed by double handle possibility” and is a powerful 1800/2000 watts and 21 cms in length. I also couldn’t resist sharing this technical coloration trolley, Moana, designed by Massimo Pizzoleo ~ which although it looks quite like a frog it is ready to go with two tinting brushes and a tin foil roll (see how it opens below). On bizarre ways to kick off Thanksgiving week ~ i’m trying that whole “live blogging” thing from the Ritz Carlton Half Moon Bay today where Oakley is holding their Oakley Norcal Shootout, and there are some serious golfers out here! But i’m hiding out in the library/high tea room at the moment… the parts you’ll probably most interested in are their road crew of two large trailers that roam the states from event to event - fondly known as the Rolling O Lab… consider it a mini of the intense testing and research lab in their Foothill Ranch HQ! Anyhow, more on the research one soon… but first things first, take a look at this HUGE slick black Oakley’d out Freightliner they have hauling the lounge around? And take a look at the interior of the lounge ~ huge flat screens inside and out, comfy couches, surfboard, skateboard, kitchen, and even Oakley Tap for the kegerator. Not a bad way to travel around the states? (These guys are on the road 300+ days a year.) Anyhow, more pics below to give you a feel… check their schedule to see where you can run into them next (next stop Tahoe tomorrow, then salt lake, then the UCLA/USC game! )… Oh, and being a golf tournament… naturally Caddy Shack is playing. I’ve been off t-shirts lately, we’ve been inunddated with them to the point that our closets can no longer handle it and its getting pretty wasteful! BUT the trend of in your face, bold, large fonts on tees to state your cause of the moment has been coming back in a huge way, and there are some pretty nice options out there. (Or perhaps i’ve just been more conscious of them since the Social Atelier launch) - I just noticed these Katharine Hamnett ones in Domino and the “MAKE TROUBLE question everything” Chomsky tee is terribly tempting as a holiday gift to everyone i know. Other favorites are Clean Up or Die (with skull! ), STOP and THINK, EDUCATION not MISSILES, WORLD PEACE NOW, CHOOSE LIFE, SAVE the Rainforest, SAVE the SEA! Anyhow, you get the point, i don’t need to keep screaming them at you (do i?) ~ and sure its pretty easy to just grab a sharpie and go at a plain tshirt for a similar impact, so i’m really showing you the Katharine Hamnett line because i also love the way she’s shot the shirts on playful models (although a bit borderline AA) and has a sleek website. See more of my faves below! 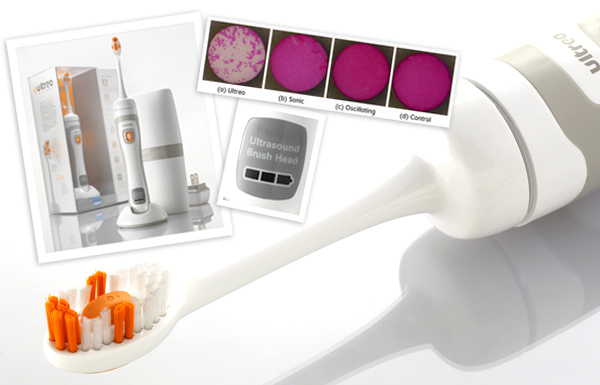 Latest in toothbrush technology? Ultrasound. No, seriously… the Ultreo uses sonic vibrations plus ultrasound. And as much as initially i thought this might just be another crazy gimmick and I initially wanted to check it out b/c the packaging was interesting, and the new technology intriguing… I didn’t expect to actually be hooked on my teeth feeling this noticeably clean relative to the sonicare elite (i haven’t had a chance to compare this to that new sonicare flexcare, but its the same technology really, only less vibrations coming through and smaller?). Founded by Dr. Pierre Mourad (who has made his living finding novel applications for ultrasound and its ability to transform bubbles into miniature sources of mechanical energy) and Jack Gallagher (Ultreo’s CEO/President who was present of Phillips Oral Healthcare for a few years) and they brought on Dr. Christopher McInnes (Ultreo’s Principal Scientist who spent 12 years with Sonicare, and provided the fundamental science behind the Sonicare technology)… they have quite a team behind the Ultreo, which has just launched its first ultrasound toothbrush . Other than the incredible clean feeling (yes, i am running my tongue over my teeth in amazement still) ~ it’s impressive that it’s far less aggressive/harsh on your mouth, less vibrations, quieter and i was told the ultrasound technology creates tiny bubbles that blast away the plaque (see the comparison study images, more below)… and how does it work? It’s all about that orange transducer in the middle of the brush head. Really its hard to explain, and definitely worth trying to understand/feel for yourself…. images below of box scans, close ups of the charger, travel case, etc. 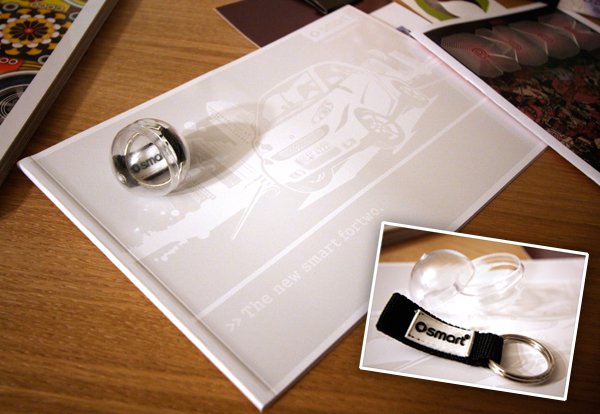 While over at the Smart House (home of the Smart Car) on Abbot Kinney for the A+R dinner, i noticed they had these great little capsules of Smart Stuff. In fact they even had playful Smart Capsule dispensers on the wall that took Smart Tokens. They were so cute, here are some pics of it all (more below). In that interesting intersection of packaging, baking, gifting, dry+shippable… we have a unique twist on how to gift cookies. Without baking. And even get to have fun layering things together much like sand art as a kid where you layered various colored sand in glass? 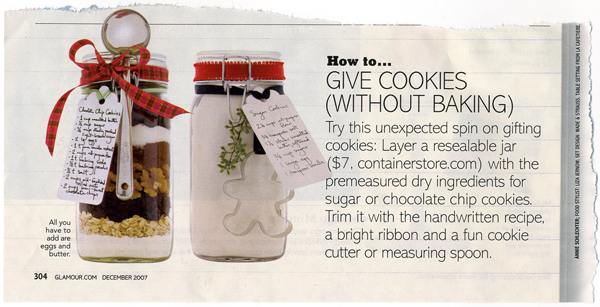 This first caught my eye in Glamour’s Dec 07 issue ~ and i tore out the page to come back to… and then browsing Neiman Marcus noticed that even THEY are doing it with their infamous internet urban legend of a chocolate chip recipe (more on both below). As usual, this got me on a little internet rampage googling up “gift in a jar” “mix in a jar” and there are a LOT of options and recipes out there… however, i must say most of my finds lead me to some pretty painfully hideous sites, and their recipes images were not that much nicer. So i’ll spare you. But as for the semi-crafty or low budgeted out there, i think we designers could do some really gorgeous things with this whole no-bake baking gifts concept… after all its really ALL in the packaging isn’t it? (If it doesn’t come out perfectly, maybe they baked it wrong! )… oh and if you’re truly lazy, you can probably just buy some nice packaging and repackage some betty crocker? 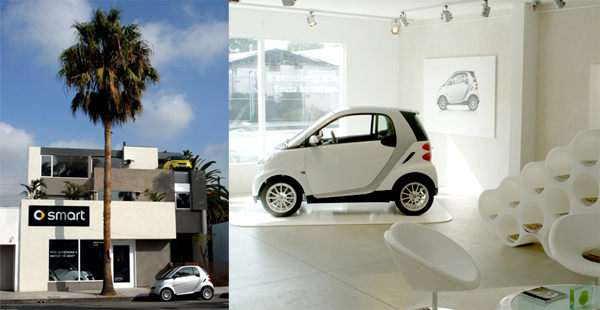 It’s always nice to find a story that incorporates great design and great business. 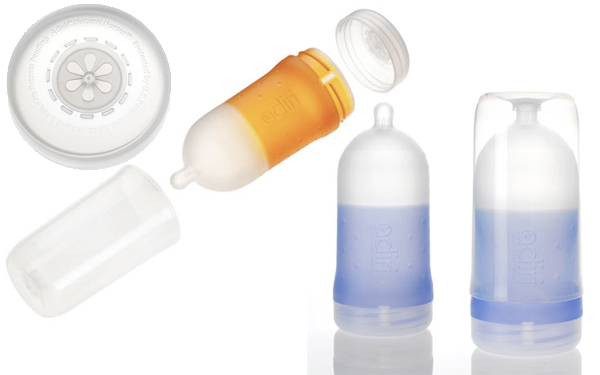 Emily over at Baggu sent me this NYTimes article “From Boutique to Big Time” By Laurie J. Flynn… it’s the story of these beautiful Adiri Natural Nursers, the “Ultimate Baby Bottle”, basically “Your breast doesn’t feel like plastic. Why should your baby’s bottle?” They’ve designed a polycarbonate-free plastic nursing bottle that has a soft rubbery grip. From the business side, the interesting story of a yahoo lawyer who’s father passes away and leaves her the company.. and how she’s gone from a mom with a boutique business to learning to scale up to fulfill large orders from places like Babies R Us… Anyhow, its a good read, and it looks like they’ve really cleaned up the design with this new model. Check out the new Adiri Natural Nurser and the article.